Suitable for 5V/3.3V MCU onborad level conversion chip. 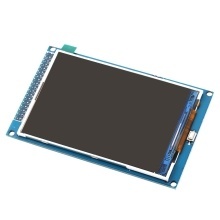 Compatible with 3.3/5V operating voltage levels. Compatible with UTFT/UTFT buttons/Utouch library. Providing 12-examples, 3-examples with STM32. With SD card socket and SPI FLASH circuit.